Industry leading technologies taught by expert instructors. Browse the full list of our technical IT courses. Why Choose NILC For Your Technical IT Training? NILC’s technical IT training courses are available in locations throughout the United Kingdom and public classroom courses are held in training venue’s in Bridgend, Cardiff and Newport. The course fees include course material, refreshments and post-course support. 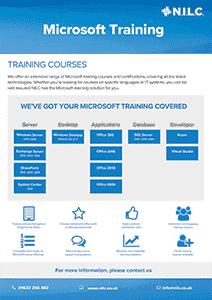 All of our technical IT training courses can be delivered and run onsite at your offices.